Will “Tech Phobia” be the Answer to the Retail Crisis? In order to adapt to changing consumer trends, many traditional retail brands are spending less money on operating “brick and mortar” stores and, instead, investing in a greater online presence. Online retail giant, Amazon, has seen its sales increase from $16 billion to $80 billion since 2010. The success of Amazon and other online retailers has decreased the demand for brick and mortar stores; this trend is commonly referred to as the “retail crisis”. However, one “tech-phobic” brick and mortar company is “bucking” the trend with 33 straight quarters of sales growth. TJX Companies, Inc. (“TJX”) is made up of T.J. Maxx, Marshalls, and HomeGoods. TJX is known for selling brand-name products at significantly lower prices. Not exactly a novel idea, but TJX has become the envy of many traditional retailers with its annual sales exceeding those of Nordstrom, Inc. and J.C. Penney Corporation, Inc. combined. The company has 3,800 store fronts and plans to expand to 5,600 over time. The changing retail landscape has impacted both higher-end brands and low price outlets. As retail spaces operate with tremendous overhead costs, luxury brands are beginning to vacate their flagship storefronts located on New York City’s glamorous Fifth Avenue. Even low-price stores, such as Payless, are being harmed by these shifting consumer trends. Payless announced that it will close hundreds of stores nationwide after its Chapter 11 Bankruptcy filing. Sports Authority, which was once the Nation’s largest sporting-goods chain, will join other brick and mortar retailers when it closes all its retail stores. The TJX model is traditional; some would even say tech-phobic. The company relies on a team of merchandise buyers who are given extensive training so that they can execute deals with suppliers on the spot. TJX has an internal mantra of “Door to Floor in 24”. With an average product turnaround of 25 days, TJX has one of the fastest turnaround times in the industry. Also, TJX does not offer discounts or promotions, and only items that do not sell within a month are placed on clearance. This ability to sell limited products quickly can explain the success of TJX: it creates a constant treasure hunt for customers. TJX is flexible and not wedded to any particular product or category. Traditional retailers worry about branding, and that worry informs much of their purchasing decisions. TJX and other off-price companies prioritize providing quality products at significantly lower prices. This flexibility allows TJX to better answer to the demand of the customers and to allow its buyers the ability to make purchases without stringent guidelines. Retailers like Nordstrom, Macy’s, and J.C. Penney’s have suppliers and are often locked into purchases months in advance. 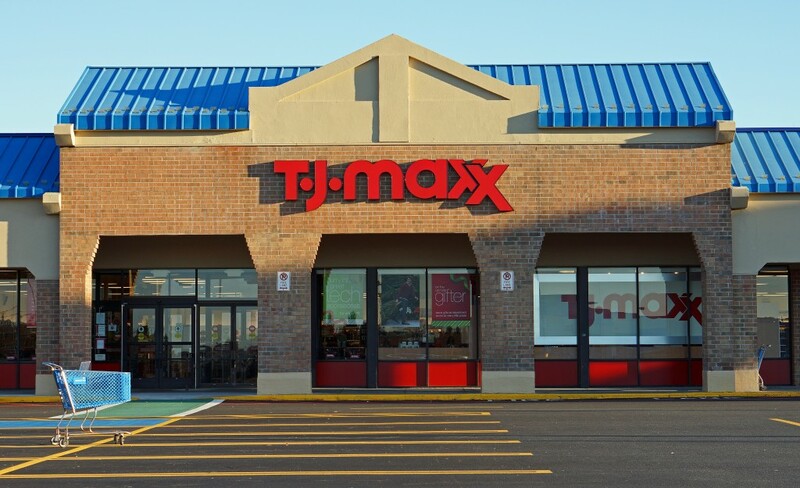 TJX depends almost exclusively on its store sales, and, in fact, has made very few efforts to operate online (T.J. Maxx is TJX’s only company with an online store). Amazon is on one end of the spectrum and TJX on the other, this leaves most other retailers somewhere in the middle without a clear pathway to financial success. Most economists and experts in the field cite a failure to innovate as the reason these former retail giants have failed. Many consumers still enjoy and even prefer to buy things in stores, however, technology will likely change what that means. Some predict autonomous driving will disrupt the retail shopping experience even further by providing mobile shopping, a combination of shopping online and the instant gratification obtained from shopping in stores. Retailers should think carefully before adopting a strategy similar to TJX or Amazon. While an argument can be made for adopting either an off-price or online business model, the success rate for doing so will depend on the product and the implementation strategy. Companies will be better served by exploring all options, which may include cessation or merger. However, it is not likely that struggling retailers will find success in avoiding innovation like TJX. Yusuf A. Brown is a second-year law student at Wake Forest University School of Law. He holds a Bachelor of Arts in Public Policy, from the University of North Carolina at Chapel Hill. Upon graduation, he intends to practice corporate law, focusing his attention on Mergers & Acquisitions Law and Real Estate Law.